The beauty of country house hotels has always been to get away from it all; to escape to the country and enjoy walking or other simple pastimes, good food, a comfortable bed and a certain sense of timelessness. This is the peaceful, slow-paced experience that continues to attract a discerning clientele to many wonderful examples of the genre. But in the 21st century country house hotels face a stark choice: unless delivering a really top-notch experience, many have struggled to turn a profit as their customers age and a younger generation of affluent consumers demands something rather different. Their upmarket mini-break expectations include spas, gyms and swimming pools, or in-house cinemas, cocktail bars and, generally, a bit of glitz and glamour instead of the joys of ticking grandfather clocks and roaring log fires. Embracing change is the key for hotels looking to attract this generation. That means extending facilities and investing heavily in modernising. One prime example is Fonab Castle, sitting on the banks of Loch Faskally in the stunning Perthshire landscape, just a short hop from the bustling town of Pitlochry. The original house dates from 1892 and was built in the Scottish baronial style by Lt. Col. George Sandeman of the wine, Sherry and Port family. Today, the house is much extended with a fabulous elevated lounge offering stunning views over the loch and hills, brasserie and a whole new wing of woodland suites. Across the path, an extensive spa and swimming pool awaits, or for those less energetic, how about a dedicated gin bar? There are even heated kennels for those traveling with man’s best friend. Opened in 2013, there are 13 rooms in the original house, which has been loving restored after 50 years in which it was used as office accommodation, with deep tartan carpeting and wood paneling, and a further 30 or so more modern rooms and suites in the Scandy-inspired new extensions. But all feature state of the art entertainment systems, Nespresso machines, fast wifi and all the mod cons generation X expects, as well as king or superking beds, waterfall showers and the full range of 5* facilities. 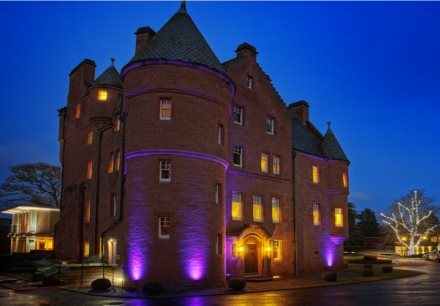 We stayed in one of the castle rooms, which was spacious and very comfortable, with no disruption from the nearby A9 main road. Dining choices include the Brasserie, which has those wonderful views to the loch and which is a chic and contemporary space, where breakfast is also taken. In fine weather it is possible to sit outside and enjoy some of Scotland’s most spectacular and lush highland scenery. But we dined in Sandemans (below), an homage to the estate’s founder, and the three AA rosette fine dining option. This small and intimate space is tucked into the wood-paneled heart of the hotel, the obvious pride and joy of manager and highly experienced sommelier, James Payne. Sandemans offers only one, seven-course tasting menu priced at £75, and one 7:30pm sitting. That allows the kitchen and small front of house team to deliver both food and wine-matching flights to guests at more or less the same time. There is a full wine list of course, beautifully chosen by James Payne, but we, and on my visit, almost every other guest, opted for one of the two wine flights on offer: the “Discovery Wine Flight,” at £49 per person or the “Prestige Wine Flight,” at £75 but which finishes in rather spectacular fashion with a glass of Château d’Yquem. A substantial amuse bouche arrived first: a little block of melt-in-the-mouth pork belly, shards of crispy crackling, caramelised apricot and heritage carrots adding lovely sweetness. From the Presitge wine flight, a glass of Ruinart Rosé was good with this, and perfect with a sweet but earthy consomme, rich with chicken, truffle and tarragon. 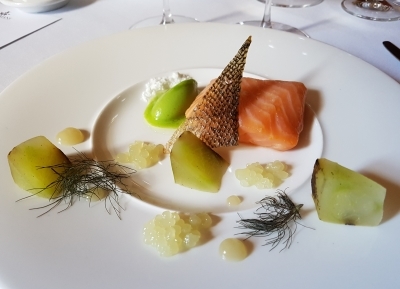 A glass of Miles Mossop’s complex ‘Saskia’ white blend picked up so many notes from the following dish of Scottish salmon, confit (but thankfully not jelly-ish), and pin-point flavours of compressed chunks of cucumber, a fennel sorbet and citrus. 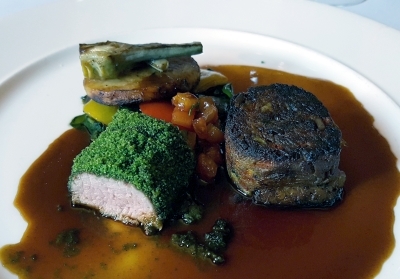 The meal was going terribly well by this point, with no let-down as Perthshire lamb was served, a gorgeous little loin wrapped in a herb crust, a slow-braised confit, a pile of braised root vegetables and a deep reduction. It really was fabulous against the Mirador Malbec from Achaval Ferrer. Two puddings were served to finish, with two glasses of dessert wine: MIles Mossop’s Late-Harvest Chenin was favoured with a take on trifle, centred on Blue Murder, a ripe, salty blue cheese from Tain in Scotland, with walnut and pear (so really more of a cheese course), then a perfectly set panna cotta, creamy and vanilla rich, but with delicate flavours of strawberry that was heaven with the Yquem, though most of that was drunk afterwards on its own, in contemplative mood. Handmade petit fours and fresh mint tea rounded things off before we headed up to the lounge with its spectacular views, to watch the 11pm Scottish summer sunset. Fonab is a bit flash it must be said, and those looking for a more deeply traditional experience may be surprised by the nods to shimmering mirror and silver in among the more discreet aspects of the decor, but where it matters, in the details of service, comfort, food and wine, it is doing a brilliant job, and has all the 21st century luxury bases covered. On my visit I witnessed a broader base of customers in terms of age and nationality than some of the more traditional venues. I also loved the fact that a small path leads to the Pitlochry Dam and its famous fish ladder where you can watch the salmon leap, and brand new visitor centre, which sits 50 metres across the water from Fonab. It made a fascinating visit after a good breakfast next morning, and was yet one more reason to plan a return to Fonab. Note too: Fonab will be hosting my old friend, winemaker Andy Cook from Mas Christine in the Roussillon for a dinner on November 3rd. Contact the hotel for reservations. Next day Andy will be pouring his wines at my Edinburgh Festival of Wine.